They were colleagues from SMRT who had gathered at Sembawang Park for a festive picnic, taking their food and drinks with them to a shelter when it started to rain. The last thing they expected was having to help one another out from the rubble after a large, 21m-tall tree fell on the shelter - leaving many with cuts, bruises and a deep sense of shock. Ms Chandra Das, an SMRT route controller who was at Khoo Teck Puat Hospital, where the 14 injured were taken, looked visibly shaken. Said the 28-year-old: "Everything happened in a second." While she escaped relatively unscathed, her husband Navin Sangar, 25, and also an SMRT route controller, required stitches on his forehead. She added: "When the tree fell, there were sharp edges poking in. Those who could slowly crawled out from underneath." The National Parks Board (NParks), while noting there were intense thunderstorms with gusty winds in the northern part of the island at the time, said it is investigating why two trees, including the one which fell on the shelter, were uprooted at the park around 5.30pm. The trees were a Tabebuia rosea, also known as trumpet tree, measuring about 18m in height and 3.6m in girth, and an Erythrophleum suaveolens, commonly known as ordeal tree, which was around 21m tall and 3.1m in girth. The latter was the one which fell on the shelter, which is located near a playground in the park. When The Straits Times arrived at the scene of the incident, a pathway leading to the shelter was blocked by the fallen tree. More than 10 workers were in the process of cutting it into pieces. In the crushed shelter were wet clothes left on the seat, along with bottles of water, packets of chips, a smudged cake and unwrapped presents. The Singapore Civil Defence Force said it responded to the incident at 5.55pm. When officers arrived at the scene, no one remained trapped in the shelter, and ambulances took the 14 injured people to Khoo Teck Puat Hospital. The transport operator's chief executive Neo Kian Hong was seen at the hospital at about 10pm visiting and speaking to those injured. 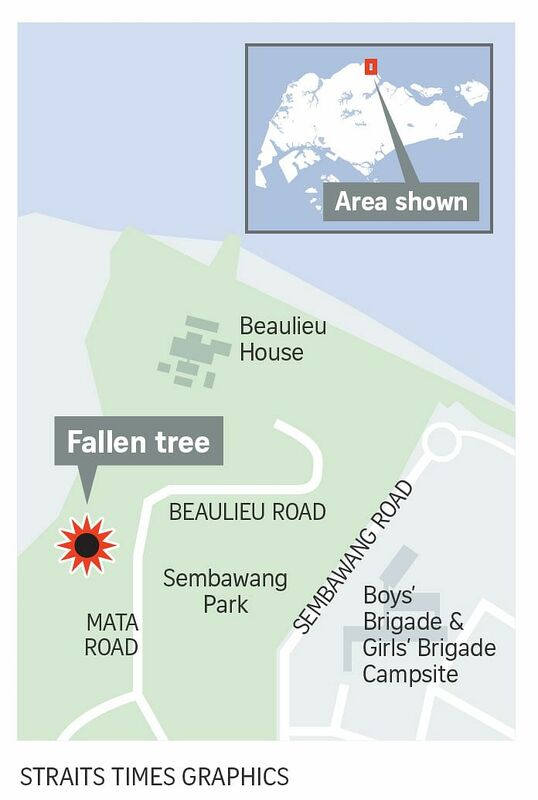 The last time there was such a serious incident involving a falling tree was in February last year, when a 40m-tall Tembusu tree fell at the Singapore Botanic Gardens on a Saturday afternoon, killing a 38-year-old and injuring four people. That tree was more than 270 years old. The coroner's inquiry ruled earlier this year that the tree was uprooted due to a combination of factors, including heavy rainfall, strong winds and root problems, and called the incident a tragic misadventure. The northern part of Singapore is no stranger to falling trees. In January, extreme weather conditions with intense rain and strong winds were reported in the north and north-eastern parts of Singapore, which led to flash floods and more than 200 reports of falling trees. Sembawang was one of the areas which was affected by winds of more than 70kmh and heavy rain. In addition, several trees were completely uprooted and obstructed pathways in Yishun Park. "To prepare for such weather events, NParks has strengthened our management of trees by replacing storm-vulnerable trees and carrying out targeted pruning and crown reduction prior to the monsoon season," NParks' streetscape group director Oh Cheow Sheng told ST in January. Mr Lim Hock Lye, the owner of Beaulieu House restaurant located in the park, which is next to the sea, told ST yesterday that the area around the fallen tree was barricaded when he arrived at his restaurant at around 6.30pm. The 64-year-old added that there was a terrible thunderstorm that started at around 5pm, but the rain had eased by 6.30pm. He also said that on Sunday, a tree in the park had been struck by lightning, but he was not aware if there were any injuries.